At some point we’re all going to breed, let’s face it. That means a new teammate who drools, babbles unintelligently, poops himself, and has to be carried around–just minus the alcohol breath. But that doesn’t mean you have to give up your tacticool lifestyle. 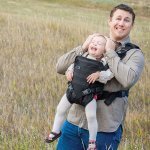 The Mission Critical Baby Carrier let’s you and baby keep the Molle times going. Don’t think this is a joke, though. All kidding aside, this bad baby boy meets all Federal specs for a baby carrier. The Mission Critical Baby Carrier is a front carry baby carrier. Simple, intuitive design makes it easy to put on and secure your baby. Baby can face in or out, depending on their stage of development. It features a removable and washable liner, hidden hood, MOLLE straps for customization, and a unique secure vest design allowing full freedom of hands and mobility. Mission Critical Baby Carriers and accessories can be purchased through the Mission Critical site here.